Spring is in full swing, and The Cypress Room’s chef de cuisine Roel Alcudia has added new dishes to the menu featuring some stand out ingredients of the season; artichoke, sorrel, English peas and spring onion. Roel’s use of each ingredient is deliberate and thoughtful, as if they were naturally arranged together from the start and cooking never took place. Like removing the artist’s hand from the painting, he allows the food to be the focal point of his cuisine by executing perfect technique. Chef is able to yield many different textures and levels of flavor from the artichokes in the dish. First, the artichokes are braised – mirepoix is sweated, water is added and the globes are dropped in. They use a cartouche, or a round piece of parchment, to cover the surface. This reduces evaporation and keeps the artichoke completely submerged for even cooking. The braising liquid is then reserved for the bariguole vinaigrette. Barigoule is a traditional Provencal dish made with braised artichokes, white wine, water, bay leaf, mirepoix and garlic, and here emulsified with lemon and olive oil. 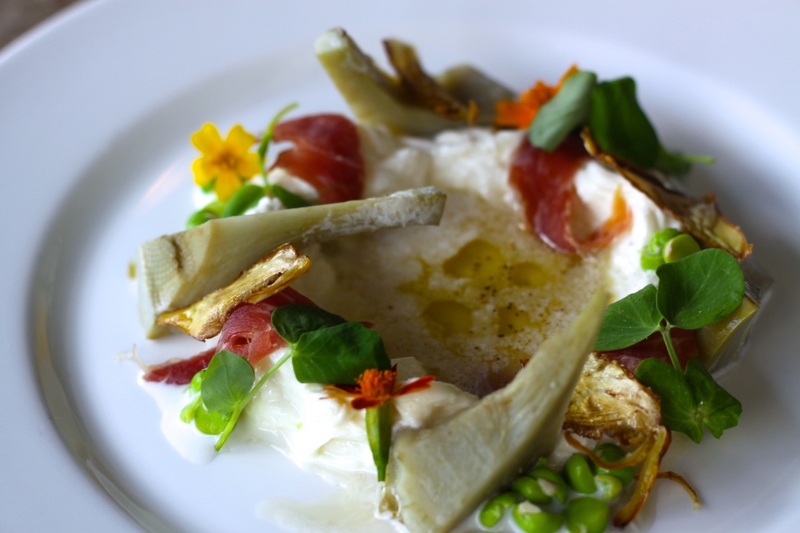 The artichokes are set off with La Querica prosciutto from Norwalk, Iowa and stracciatella from mozzarita in Pompano Beach, Florida. The Cypress Room team journeyed to SWANK Farms in Loxahatchee, FL for Dinner en Blanc. Sorrel and frog legs are a natural complement, Roel explained, as it if was something I was supposed to know. 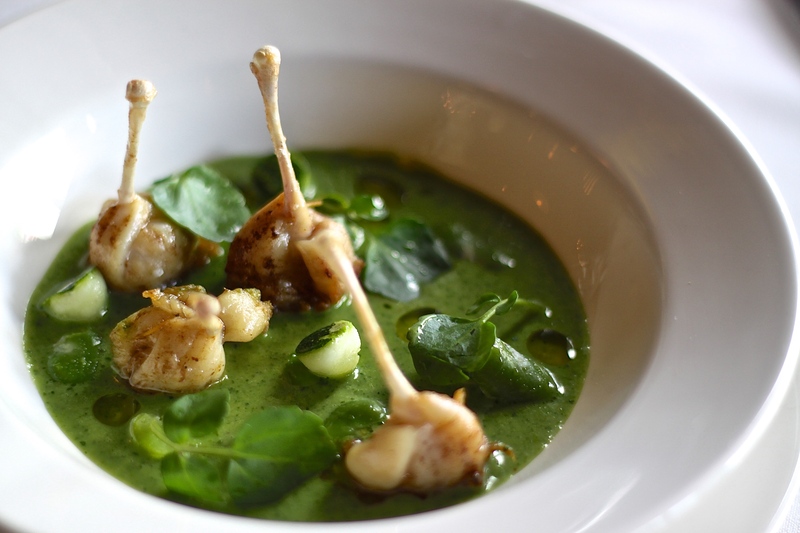 The perfectly pan seared frogs are nestled in a sorrel and watercress velouté, one of the five traditional French ‘Mother’ sauces. To start, the frogs are broken down and legs set aside, the rest of the bones are roasted in the oven and serve as the stock base. Mirepoix is added, then garlic, potatoes, and white wine. This liquid is reduced. And strained. And reduced. The sorrel and watercress are blended to retain their bright color and flavor. The fava beans and zucchini are blanched and set into the velouté. Before and after service, Roel is usually in the back corner of the kitchen, head down, butchering the evening’s proteins. The walk-in speed rack is lined with clean, perfect duck breasts. The ingredients in this dish are continuously overlapping. Beginning with the petite pois a la Françoise, young green peas are reduced with carrots, bacon, cipollini onions, lettuce, butter and chicken stock. The Cypress Room pickles the rhubarb in hibiscus flowers, strawberry vinaigrette and honey and cooks it down into a gastrique using duck jus, brandy and green pepper corns. 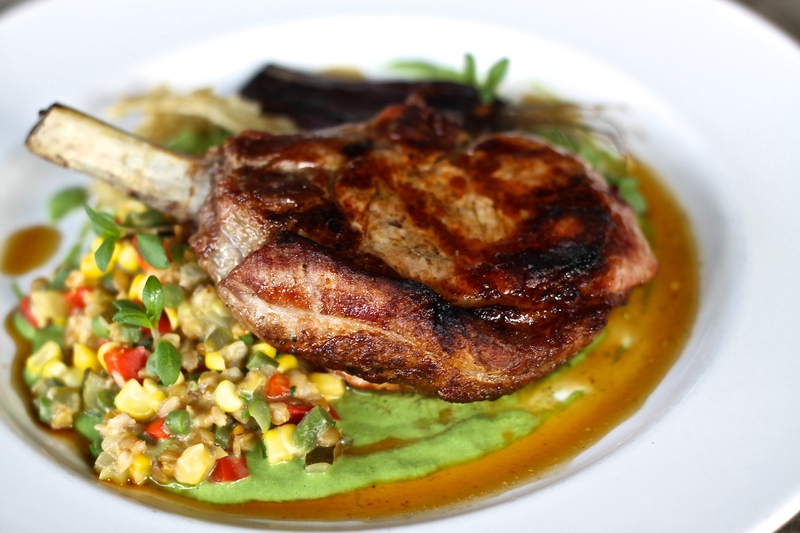 In the Pork Chop entrée, the succotash combines spring onions, bell peppers and zucchini. Here, the onions also act as an aromatic, bringing out the sweetness of the other ingredients. After the ingredients have stewed down, the grilled corn is added. Lastly, farro and lemon is incorporated. What makes the soubise unique are the scallions and slow roasted onions that the chefs blend into their béchamel sauce. The pork is tied with butcher twine to ensure even cooking over one of the most important and defining pieces of equipment in the kitchen — its wood grill. The plate is finished with a grilled lila onion and tempura fried onions roots. 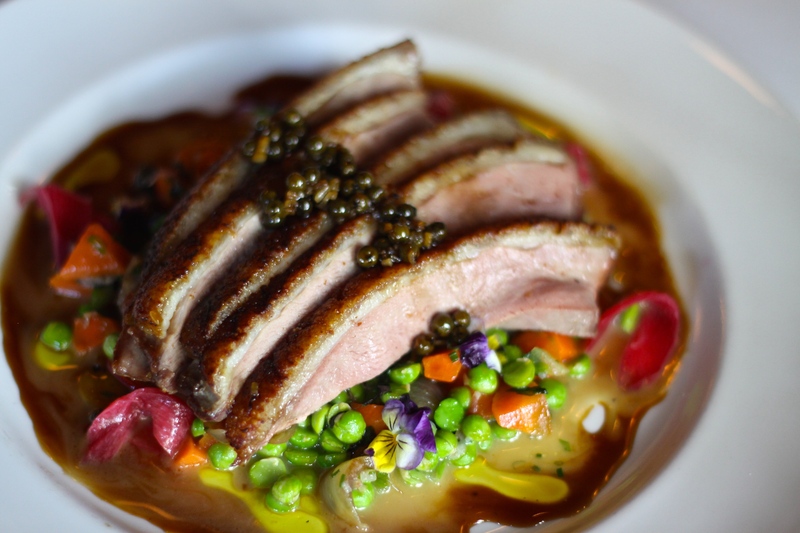 Find The Cypress Room menus on its website, at thecypressroom.com, and enjoy a taste of spring before it’s gone! ← Buck’s Brewery Alert: May is for MIA!